Use a knife to scrape along the magnesium side of the fire starter. You want to scrape enough to have a small pile about the size of a quarter. Be careful so you keep the shavings in one spot. It helps to have a platform that will catch what you scrape. You can use a piece of wood, a piece of cardboard, or anything else that will help you keep everything together. In high winds, a depression may be necessary. That means dig a small hole so that hte wind blows over top of the shavings and doesn't blow them away. 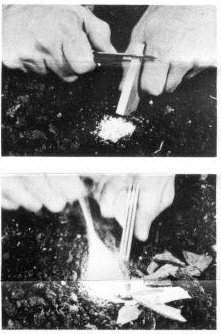 Once you have a small pile of magnesium shavings, ...To continue reading, click... How to Use a Magnesium Fire Starter. We carry only one brand of mag stick. Doan's Machine & Equipment Co, Inc is the only manufacturer we trust for this particular product. We only stock this particular brand of the magnesium fire starter because of it's durability. What do we mean? Other types of this product have a single deficiency: the flint rod that you scrape in order to produce sparks does not stay attached to the mag stick. If you don't have the means to create a spark, you don't have anything. We're tried several of the others out there and they all will break off fairly easily just by dropping them. Heat and Cold tests failed also. 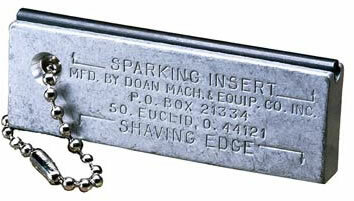 Only the Doan's Flint Magnesium Fire Starter stays in place. This is the best magnesium fire starter there is. While a ferro rod and some good commercial tinder are faster to get a fire going, this indestructible block will never go bad or leave you out in the cold. Uses magnesium as flame source of 5400° F. One fire starter should provide sufficient shavings to start dozens of fires. Great for any backpack, survival kit, bug out bag, or as part of any emergency gear. The ability to make a fire in a survival situation can mean the difference between life and death. Using the magnesium stick saves your limited supply of matches and will certainly not be used up even during a prolonged survival episode. If you have the time, use the magnesium stick. It's good to practice with whenever you can so during a real world emergency, you'll be an expert in its use and get a fire going much quicker. In a survival situation, a fire is your main source of warmth, light, and comfort. This is the military issue magnesium firestarter. The flint rod will not break off in extreme cold, heat, or dropping on a hard surface unlike other models. Something to think about when buying one of these. You want your fire starter to stay intact.